The "Xtreme" panels from Duropal are a decorative, high-pressure laminate in postforming quality with a durable, melamine resin surface and a ground rear side. Surface material for high quality kitchen and office furniture, for walls and doors, furniture and fixtures in retail and recreational facilities, gastronomy, administration buildings, sanitary, hospital or laboratory areas. Especially for when there are particularly high standards for strength, ease of cleaning and hygiene. 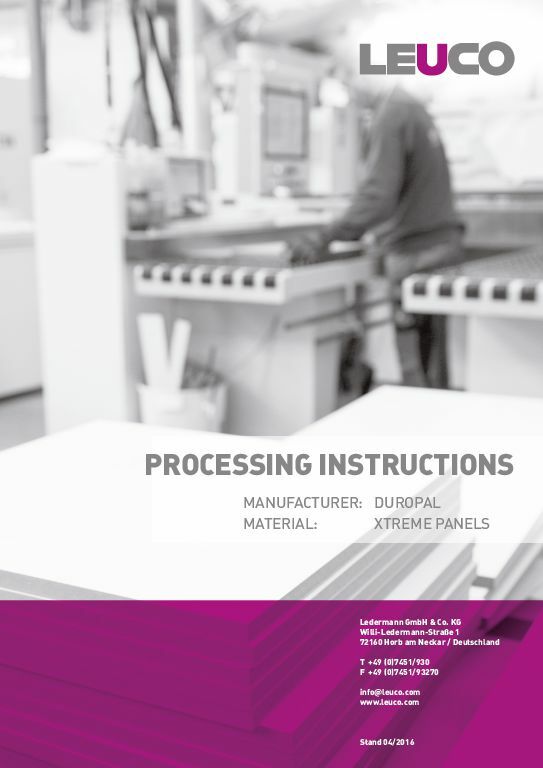 Tool stress when processing Duropal XTreme panels is higher than with the majority of wood-based panels. Carbide-tipped tools (HW) can be used for processing. For large numbers of pieces and when using modern, automated processes, we recommend the use of diamond tipped tools (DP). These provide very good processing quality and long edge life. In the LEUCO online catalog www.leuco.com/produkte Click in the workpiece material filter on "Specific workpiece material manufacturer." In the next step, select "Duropal" and in the next step select "Xtreme." You will then receive the selection of saw blades, hoggers, cutters and drill bits that LEUCO recommends for clean and chip-free processing of Xtreme surfaces from Duropal.